To honor veterans and our community, Proulx Oil & Propane has sponsored “The Power of Peace,” a majestic sculpture of an eagle designed and painted by local artist Frank Sharlow. The sculpture will have a place of honor in the 2016 Salute our Soldiers (SOS) Eagle Parade, organized by the Seacoast chapter of Veterans Count, an Easter Seals program that provides critical and timely financial assistance and services to veterans, service members and their families to ensure their dignity, health and overall well-being. A total of 46 local artists designed and painted fiberglass eagle sculptures, which can be found at businesses throughout the community. To raise awareness about this important initiative and give him a name worthy of his (or her) stature, we’ve launched a contest where you can submit your name suggestion. Visit our Facebook page to learn more and enter. 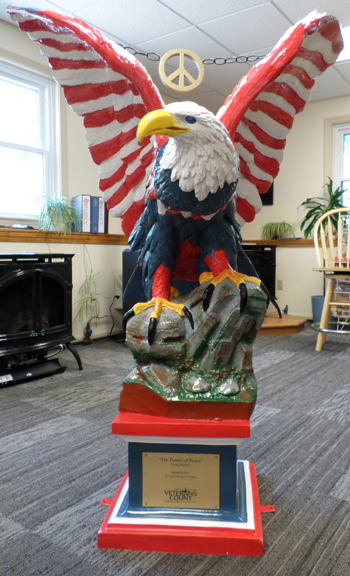 On Veteran’s Day - November 11 - Veterans Count will auction all 46 eagle statues, and 90 cents of every dollar will fund emergency services to military families throughout New Hampshire. The auction is at Service Credit Union in Portsmouth. Please check the Veterans Count Eagle Parade website at vetscounteagles.org/ for more details. Giving back is extraordinarily important to us! We are honored to be a part of the great work that Veterans Count and Easter Seals does to serve our community.